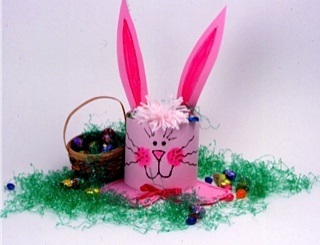 This bunny basket is so simple, even preschoolers can make it. It is fun to let the kids make and share with their friends. Lay the paper bag flat with the glued side down. Sketch a pair of rabbit ears on the top half of the bag. Cut the ears out, leaving the front and back ears attached to the bag. Cut the sides of the bag even with the bottom of the ears and cut the milk carton to the same height. 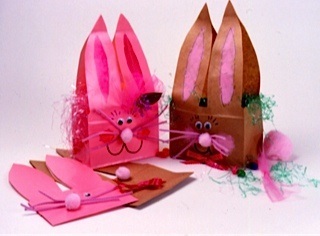 Decorate the bag with a bunny face and finish with a small pink pom-pom nose, pipe-cleaner whiskers, and a cotton-ball tail. Insert the milk carton in the bag and fill with Easter grass and candies. Glue the front and back ears together at the very tops. 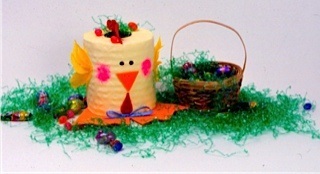 Use toilet paper to make the bunnies and chicks. Glue ears into bunny by spreading the paper enough to snug ears in place. Glue beaks and feet in place. Sponge paint onto feet and ears of bunnies to create the appearance of fur. Push Easter grass and candies in the tube. Decorate with small flowers or pom-poms, a tied ribbon at the neck, and a hat for the duck. If you cannot find the color of tissue that you would like, just spray paint. You can also put contact clear paper around the tissue paper to make it stronger. Here is a chick made from a bathroom tissue roll. Dian Thomas’s Library: You will never run out of ideas when you have this wonderful set of books. Check out Dian Thomas’ Creative Books Library Special: She now has a special offer to save 60% on 5 books and 1 DVD. Get Dian’s creative library for only $40.00. Save $60 and have more than 25 years of her creative and amazing ideas. This package will be great for gifts, for fun, and for kids and grandchildren. Take advantage of this limited offer at www.DianThomas.com. Dian’s book Tipping the Scales in Your Favor shares her weight loss journey. For years Dian tried and tried to lose weight, but it was not until Jackie Keller said to her in California, “I can help you lose weight,” that she caught the vision and lost more than 115 pounds. Most important, she has been able to keep it off. Get Dian’s book today and begin the journey to healthy living. Go to www.DianThomas.com to learn more. Want to travel with Dian? Join one of her trips to China or Vietnam this fall, where you will enjoy a cultural feast and fun adventure. Email Dian at Contact@DianThomas.com or call 801-277-4332 for more information.